"The things that keep me alive keep me alone..."
- Fink, "This is the Thing"
In the spirit of full disclosure, I have to warn you before we go any further: Ever since her feature film debut in the classic Mean Girls, I've been smitten with Amanda Seyfried. She's cute, she's talented and she has an energy that makes you relish every second she's on screen. 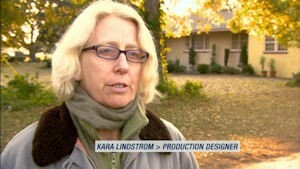 She just has "it", and her building catalog of work proves that filmmakers and fans think the same. But wait, I'm not done! I'm also smitten with Channing Tatum. He's cute, he's charismatic and he's cute (wait, did I say that already? ), and his energy alone is enough to get me in the theater. I've been a fan ever since the classic Step Up ("I'm fighting for something that's real for the first time in my life! "), and every time I re-watch it I envision myself in the role of Jenna Dewan (now Tatum's real-life wife), and all is well in the world (although she looks much better in legwarmers than I do). "You don't scare me, John." Sigh! [insert girlish swoon here] The film is certainly in capable hands: Not only is it based on a novel by Nicholas Sparks (the same man responsible for The Notebook, A Walk to Remember, Message in a Bottle and Nights in Rodanthe), it's directed by Lasse Hallström (The Cider House Rules, Chocolat and The Shipping News). But to my sad surprise, the honeymoon was soon over. By the end of Dear John, I was stunned at how a film could ultimately fumble the chemistry between these two leading talents, leaving me surprisingly empty and unsatisfied. Back in Charleston, South Carolina, John Tyree has also left behind his single father (Richard Jenkins), a shy, slightly awkward and quiet man with a heavy interest in coins--a theme used to draw parallels throughout the film. Like his son, dad doesn't offer up information easily--and usually keeps his feelings bottled inside. Savannah thinks John's dad might have a mild form of autism; she is used to the signs, having grown up next door to afflicted boy Alan (Braeden Reed) and his dad Tim (Henry Thomas), a kind soul who looks out for Savannah--who is also stringing along wannabe boyfriend Randy (Scott Porter of TV's Friday Night Lights in a pointless role). Savannah is a do-gooder who likes to volunteer her time and one day hopes to open a horse farm for children, while John has a trouble past that hints at violence (a pointless subplot that goes nowhere). When I try and pinpoint where this film goes astray, it's during John's extended tour of duty where Savannah virtually disappears. This isn't her film, but temporarily abandoning her character only serves to kill our buzz--so much so that when they are finally reunited, I was kind of over it. It's a mistake made all the more glaring when we watch the troubled relationship between John and his father grow--the film's most powerful scene belongs to them, and their arc provides the more emotional experience. It stinks, because Seyfried and Tatum are great together, and the early parts of the film have a magic despite the story's familiarity. The two are able to rise above the material and create a spark, something that the film desperately tries to reignite later. But for me, it couldn't. That's due in part to the script, which isn't very convincing in the moments that it needs to be--including a key argument midway through where the two fight over John's decision to extend his tour after 9/11. There isn't nearly enough depth to the scene, and (like many other scenes here) it made me question whether it was the script or the actors that were failing each other. By the time Seyfried is forced to utter the awful line "It's so good to see you...here...alive..." (one of many, including an odd response to some bad news), I leaned more toward blaming the script (although the duo's delivery isn't always so convincing, either; they also sometimes come across too "young" to pull the material off, especially near the end). An equally odd dinner talk--followed by an "Oops! I spilled wine on us and now we have to take off our clothes!" moment--didn't help. Dear John feels like a lot of vignettes pasted together; we're given "moments", but it's the stuff in between that betrays us (and the actors). In addition to major plot misjudgments, we're also treated to minor quibbles that feel out of place. As with his previous works (which I can't say I'm very enthusiastic about), Hallström is happy to indulge in some lush scenery, and lots of scenes unfold without words (if you like romantic montages, you'll be pleased). You get the sense he's aiming for a hypnotic poem that unfolds like nature, and visually this film is frequently striking. But when it comes to the power of its central relationship, the film misses the mark--a travesty considering how exciting Seyfried and Tatum can be. The anamorphic 2.40:1 transfer is solid if not stunning. Hallström opts for many warm tones (save for a memorable underwater shot, the colors don't tend to pop), and while many close-ups reveal nice detail and texture, some of the darker scenes (especially wide shots) aren't as successful. Overall, no major complaints. The 5.1 track is strong, although some early scenes don't seem to have the best balance with dialogue and background noise. From the battle scenes to the ever-present chirping birds, the rear channels get good use. An English Audio Descriptive Service track is also included, while subtitles come in English and English SDH. The boring stuff starts off an otherwise solid set of extras: 12 deleted/alternate scenes (totaling 10 minutes in non-anamorphic widescreen) don't offer much, although the 11th scene (:32) revolves around one of the more crucial encounters (the second scene, which tacks on one difference, suffers from low audio). The alternate ending (3:34) starts the same but offers, for me, a better conclusion; while outtakes (2:17, also non-anamorphic) aren't quite as entertaining as I hoped (I thought Seyfried and Tatum would account for a wealth of chuckles). Next up is A Conversation with Channing, Amanda and Lasse (5:16), where the actors and director talk (separately) about each other. The director notes the stars improvised a lot, and some of their own personalities and touches made the final cut. "I'm interested in trying to stay away from sentimentality, but I do like strong sentiment," notes Hallström, who wanted honesty in the performances. "It's a fine line there, and I love to walk that fine line." Adds Tatum of the director: "He's so sensitive and so, sort of gentle in this, like, brilliantly...genius way. He's like a genius little baby...he's got the softness of a child, but the old soulness of someone who's been here forever." Things start to pick up with Transforming Charleston (14:47), where production designer Kara Lindstrom and director of photography Terry Stacey talk about transforming the South Carolina city and its surroundings--where the entire film was shot--into convincing representations of John's travels to Africa, Afghanistan, Istanbul and Eastern Europe. "I like her attention to detail," notes Lt. Col. Gregory Bishop, U.S. Army Dept. of Defense Project Officer, pointing out her authenticity and her little nods to Hallström. "She would have made a really good Army general." Bishop returns in the even better Military in Movies: Dear John's Military Advisors (10:59). He's joined by Capt. 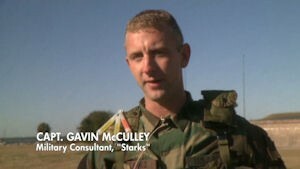 Gavin McCulley, a military consultant who also got a small role in the film. They talk about their attraction to the project (top of the list: John is a good soldier) and how they strived to make the dialogue, locations, costumes and situations authentic. 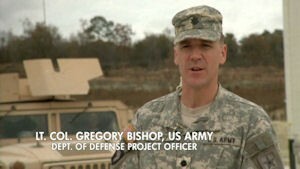 "Movies and the military are not that different," says Bishop. "The logistics systems and the logistics trains required...it's really the same sort of challenge that a brigade combat would have in going from one location to a field location." Both men share some of their experiences in the armed forces and how they tried to bring that to the film, and both compliment Tatum's attention to detail and desire to do the Army proud. 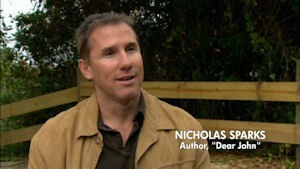 Author Nicholas Sparks gets a very quick segment at the end; I wish he was included more in the extras. 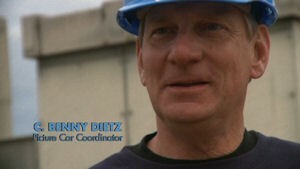 Mr. Tyree, The Mule and Benny Dietz (4:49) is an interview with Picture Car Coordinator Dietz, whose passion for coins helped inspire the script and Richard Jenkins (also briefly interviewed), including one personal story that found its way into a scene. The best is saved for last: The Story of Braeden Reed (24:22) focuses on the actor playing young Alan. Produced and narrated by Erik Anders Lang, this chronicles how autism has shaped the young boy's life, including his time on set (which led to more spontaneity and improvisation on camera) as well as his family life. It includes interviews with his amazing parents, his teacher, the film's autism technical consultant and others. In addition to presenting a moving personal story, it also shines a light on the affliction and its challenges. 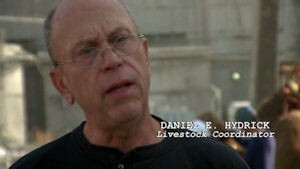 The most touching moment comes when livestock coordinator Daniel E. Hydrick relates his experience with Braeden in a scene involving a horse--something he didn't think the child could handle. A great view from start to finish, it's the hidden gem in the extras. Trailers round out the package. I couldn't cast a more charismatic young duo than Amanda Seyfried and Channing Tatum, and their chemistry is undeniable. For a while in the simple Dear John, it works, enabling romantically inclined viewers to forgive the film's predictability. But eventually, the story and script betray them, sapping them of their charm as the film stumbles to an oddly unfulfilling conclusion. Still, the duo is exciting enough to lift much of the film, and an emotional father/son subplot is touching. Rent It.